Johnson Ladota is a coordinator for the highlands area of North Malaita under the KGA partner Baetolau Farmers Association. 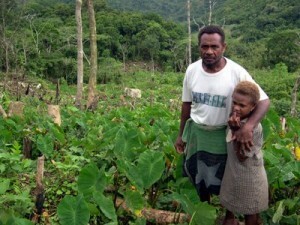 Johnson is an active farmer himself - seen here in his highlands taro garden at Masilana. KGA does not have permanent field staff reporting to headquarters. Rather it has partner organisations who hire and supervise their own local staff. Each partner is supported by KGA to have one ‘Partner Helper’ who coordinates their local program of Kastom Gaden activities along with one administration staff who helps with book keeping and admin. Partners then have their own networks of farmer experts who act as occasional resource people during village based training for farmers.